Welcome to a big fall unboxing party! 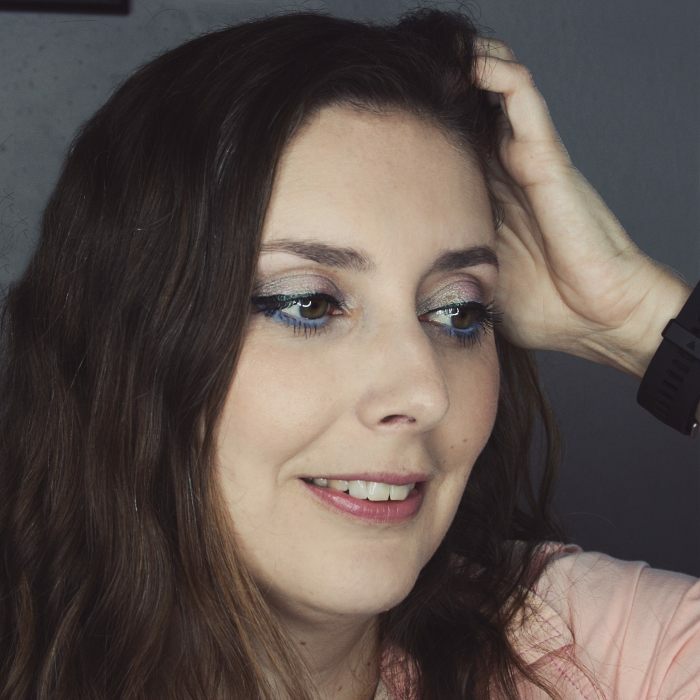 After the Sephora Play! 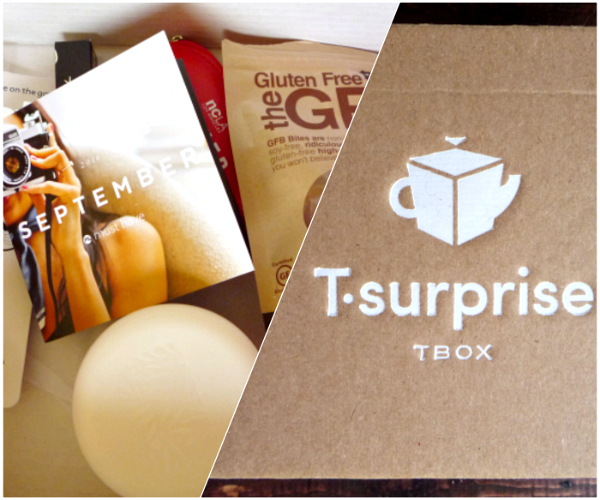 Box last week, I have TWO more exciting subscription boxes to open with you today. Without further ado, let's dive right in! I'm not sure you knew that about me, but I'm a real tea fanatic. I'm addicted to tea, quite literally: I can't start my day without having a cup of tea. Tea brings me the focus and energy I need to get things done. Basically, tea is for me what coffee is for most people. My favorite kind is Earl Grey tea, a black tea flavored with bergamot essence, and I drink it "black", no sugar, no milk, no lemon. 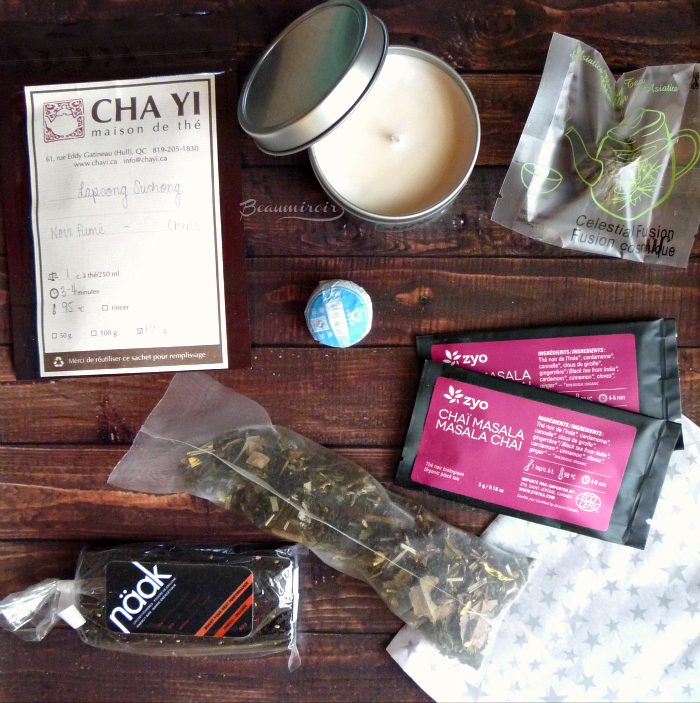 Although Earl Grey is my top choice I always enjoy discovering new aromas, so I was very excited when TSurprise, a Canada-based company, offered me to try one of their subscription boxes. - Essence of Nature Flower tea by Asiatica: it's one of those balls of tea that opens up and seems to bloom into a beautiful flower when you put it in hot water. How cool does it sound!? I've been wanting to try one of these fun tea flowers for a while, so I was really excited to find it in this box, and even more to learn that it's jasmine tea. I love it almost as much as Earl Grey and citrusy teas. 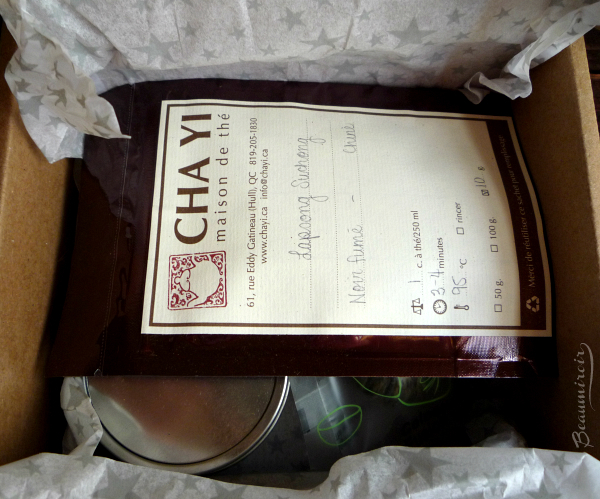 - Indian Chai Masala by Zyo: I got two little sachets of this fragrant chai. I'll keep it for the winter season when I'll best enjoy the spicy flavors of the cardamom, cinnamon, ginger and cloves! Added bonus: it's organic. - Chinese Lapsang Souchong by Cha Yi: this one came in a generous bag of loose leaves, and it's the first I tried. I've been drinking smoked and fermented teas for years, but this one is by far the smokiest black tea I've ever tried! It's made in the Wuyi Mountains in the Fujian region and smoked with burning spruce roots. If you like a high-quality smoky tea, it would be right up your alley. Just don't let it steep too long because it can become liquid smoke! - House Ice Tea: Rue de Colombo by Comuno-t. This blend smells very fruity and it will be perfect for the hot fall days we have ahead of us in San Diego (September and early October can be very warm here). I also visited Sri Lanka 2 years ago and I'm hoping that the flavors will take me back to the bustling, fragrant city of Colombo! The directions suggest using it for a "cold brew" by letting the large silk bag infuse in cold water for 6 hours. I wonder if I should keep it in the fridge during that time. - Pu Erh Yunnan Ansestor Antique. This aged tea has spent 8 years developing its flavors. It comes in a little hard ball made with the leaves all pressed together, so you need to rinse it with hot water before use to loosen them up. Another cool, and for me as a Westerner, unusual type of tea I'm excited to try! - Näak Bar, the snack for this month. It's made with... cricket flour. Talk about a surprise! I have to admit that I'm not too adventurous when it comes to insect delicacies, so I let my friends taste it when we went for a hike. Most of them were actually excited to try it. They said that you couldn't tell it contained cricket powder, which is a great, environment-friendly source of protein by the way, and that it tasted mostly of chocolate and orange. If you're looking for an energy bar that's sustainable for the planet, you should really look into it! - N°1 Woodsmoke candle by T. Lees Soap Co. This soy wax candle by a Montréal-based company smells just like a campfire! I really love the smell of the fire when we go camping, so I absolutely adore this candle. If you want a full smoke evening, light it up while you drink the Lapsang Souchong included in the box! 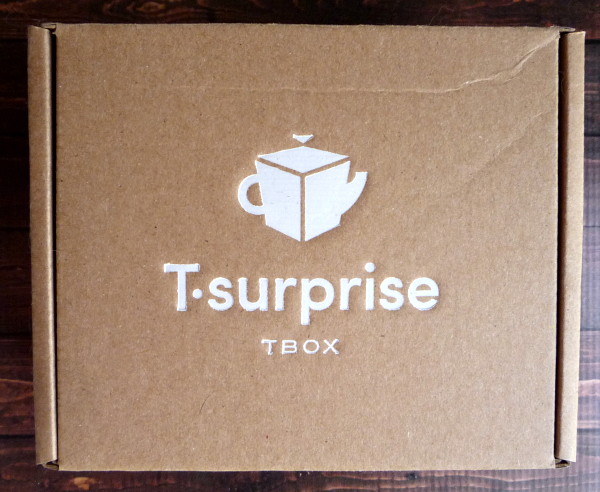 For a tea lover like myself, the TSurprise Tbox is a fantastic concept! If all the boxes are as good as the Under the Stars one it's also an excellent value. I've bought small bags of tea in specialty stores that were more expensive than this box. What made the box really fun is that they really tied everything to the outdoorsy theme nicely, including the starry wrapping paper. You can buy a single box if you want, think about it for the tea enthusiasts around you as it would make a great holiday gift! Wink wink. 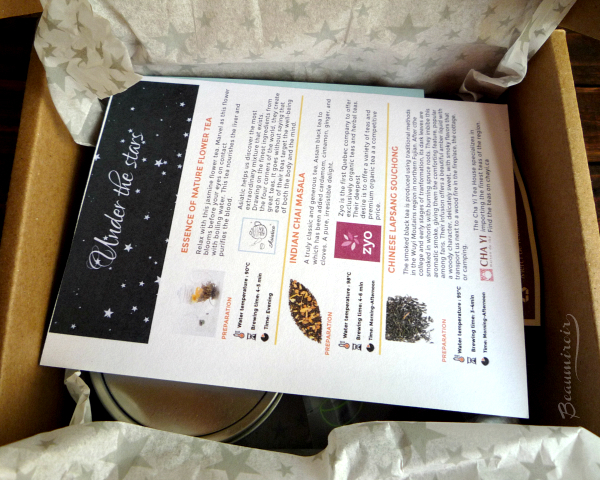 Le'ts jump from tea to a lifestyle box with the famous Popsugar monthly selection. 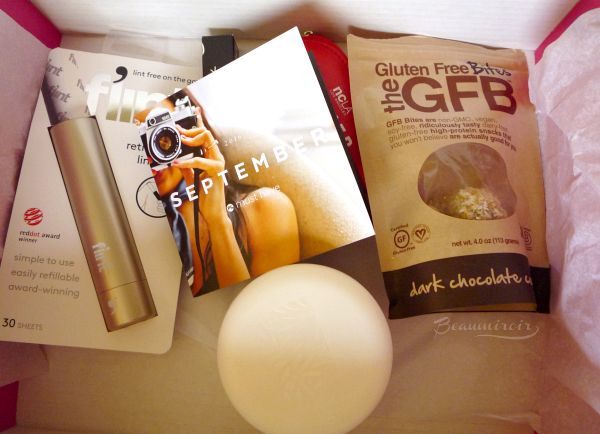 I was kindly sent the September Must Have Box for consideration, and I'm really quite impressed by its contents. Let's unbox it! - a hat! 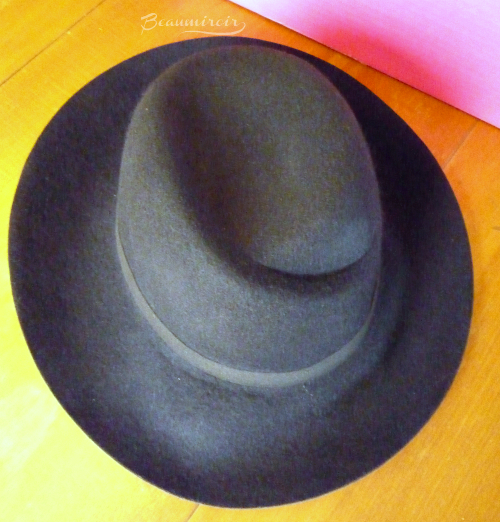 Not any old hat, but the Jack & Lucy Bicoastal Wide Brim Hat. I'm not used to wide hats at all, but I'm really excited to pair this accessory with my winter outfits (this sturdy felt hat is just too warm for the current San Diego fall weather!). The quality is amazing, and you can pull an invisible ribbon inside to adjust it to your size. Smart! 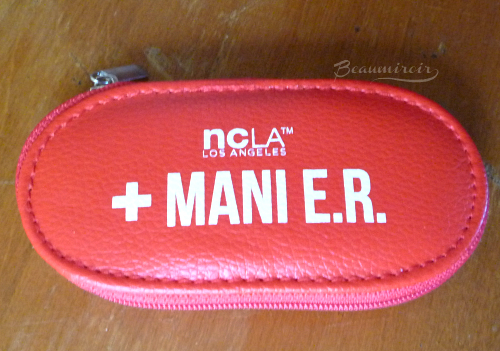 - NCLA Mani-ER Tool Kit. I admit that I was hoping for a set of mini nail lacquers when I saw the brand name. I've been wanting to try the NCLA lacquers for so long! 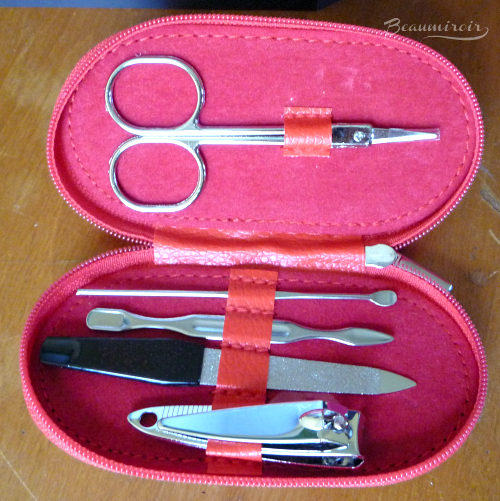 But the little manicure set will come in very handy when I travel, and I know I'll even use the scissors at home. - Briogeo Don't Despair, Repair! Deep Conditioning Mask. This is a huge full-size item! I got a sample of this hair mask in a past Sephora Play! Box, but I haven't had a chance to try it yet. 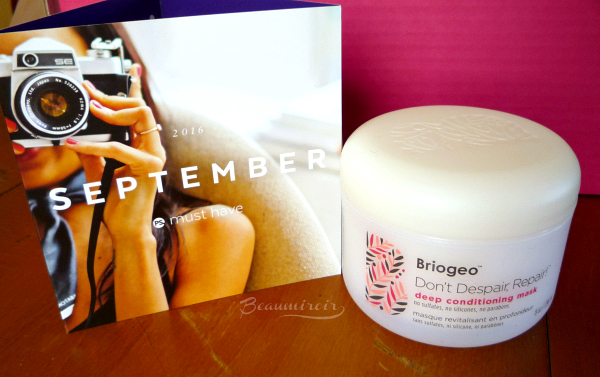 For my dry and fragile hair a deep conditioning, hydrating mask is always a good idea. I'm just one of these rigid people who like to finish their open product before trying a new one! 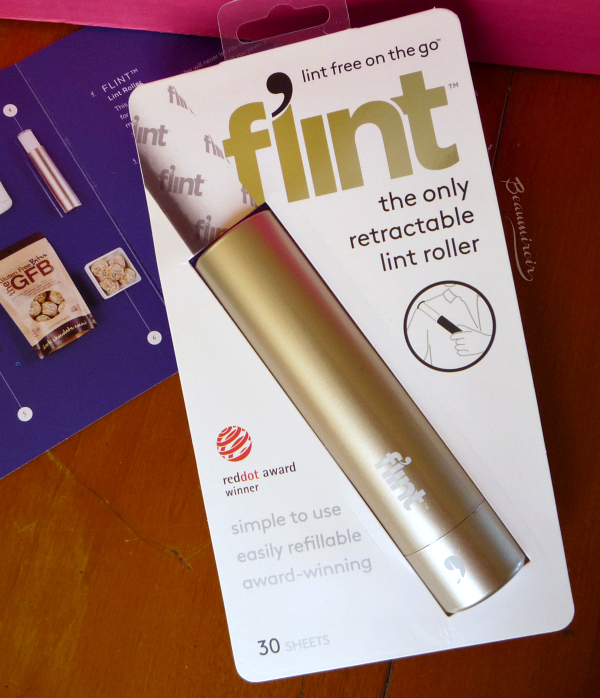 - Flint Lint Roller. Someone at Popsugar must know me... You know I have a fur baby called Ernesto, but what you don't know is that he's long-haired and that when he's shedding, his hair gets EVERYWHERE in large amounts. Up my nose, under my contacts, on my food, and, of course, covering my clothes in a furry gray coat. Removing the hair from my dark clothes is a constant battle that I never seem to win. I roll allover myself with a sticky roller, make two steps towards the door, and bam, I'm covered in hair again! So this thin retractable roller is exactly what I need in permanent residence in my purse! I've tried to carry lint rollers but of course they stick to everything, including the plastic bags I tried to wrap them in, so it made a terrible mess. Of course this one is refillable. 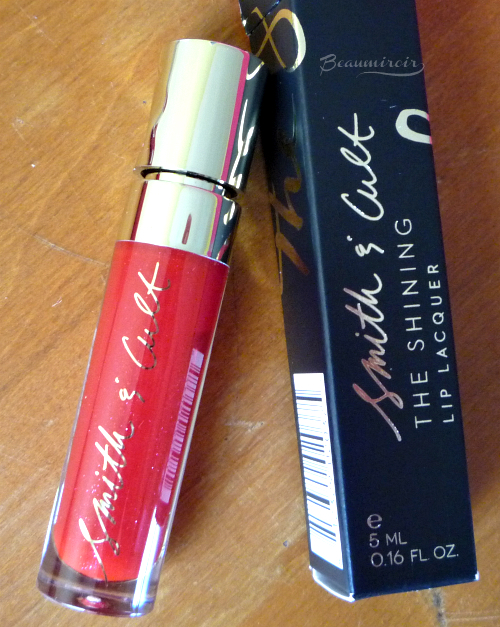 - Smith & Cult Lip Lacquer in The Warning. Yes! Smith & Cult is another brand I've been wanting to try for years! I love their chic packaging with just a bit of edge in the expertly "dented" look of the cap. The red shade with subtle gold shimmer will be perfect paired with a neutral look for fall, and of course with the hat. 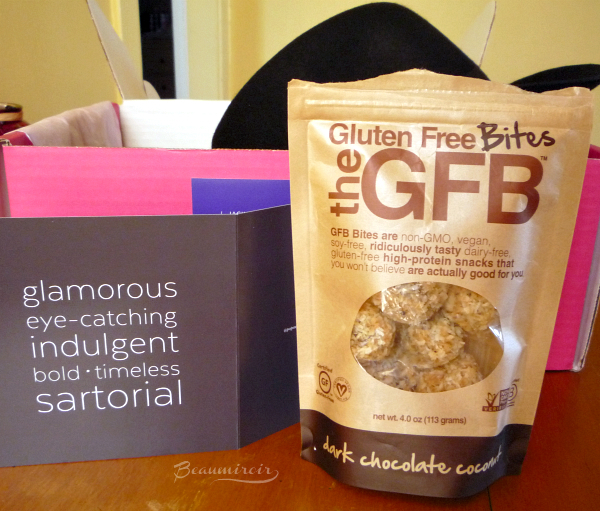 - The Gluten Free Bites Dark Chocolate Coconut Bites. I don't need gluten-free (I love gluten, give me my baguette!) but I'm always happy to try new snacks. These bites are quite filling without being too sweet, so they're perfect for a pre-workout energy boost or to curb mid-afternoon hunger. I'll give you unsolicited French girl advice though: try not to snack in between meals. One or two bites before your zumba class, okay, but don't eat the whole bag for no reason! I'll eat those bites for breakfast. 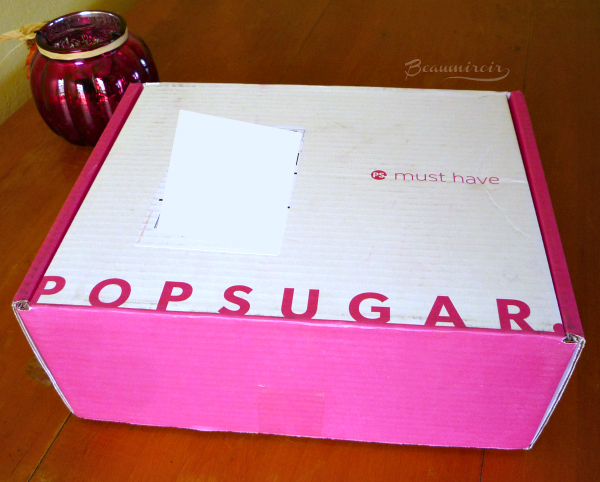 I think that Popsugar did a great job putting together a fall themed box this month. 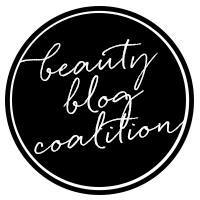 There are two beauty brands I'm very excited about, a cool fashion accessory, a useful tool and everything is full size. 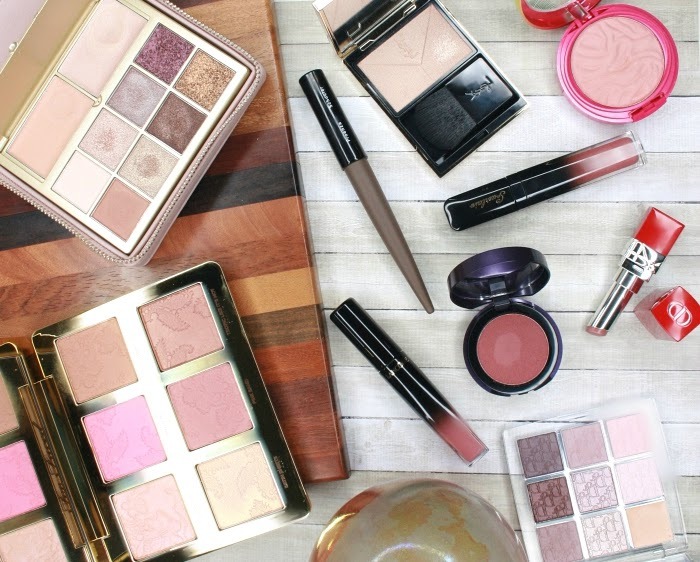 I'm more used to beauty boxes, but I actually really enjoy discovering a mix of "lifestyle" products like that. The monthly cost of $39.95 seems a bit high at first, but the value is very good and it's like receiving a box full of Christmas gifts every month throughout the year! On Popsugar's website. You can use coupon code SHOP5 for $5 off your first Must Have Box! The boxes featured in this post were sent by PR for consideration. I received no compensation to write this post, which only reflects my personal opinion. This post contains affiliate links.